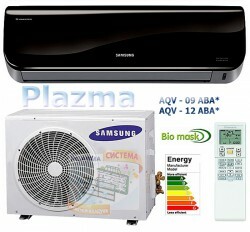 AQV-09/12 KBA, — it is black — the violet unique-colourful design of the internal block of air conditioner Samsung of series Jungfrau bewitches and чарует. Protection of the compressor of air conditioner Samsung, series Jungfrau and Monte which allows the air conditioner to work even in strong heat to +52 °C. Economy effort of energy which reduces consumption of an electricity at the expense of the built in algorithm, — decrease of turns of twirl of ventilating fans at achievement by the air conditioner of the set, adjusting temperature. Some tell that models of this series of air conditioners Samsung, — are similar to soap trays, do not get into the head, do not pay attention, are gossips and intrigues of competitors, the most mass and truly national brand of climatic technics Samsung Electronics Company. Samsung AQV-09/12 ABA series Monte, — инвертерный, the air conditioner executed in black colour, with production engineering Smart inverter. special filter element with a silver covering. The dust is not present!! Applying production engineering Silver Coated Health air conditioner Samsung Monte AQV-09/12 ABA, — on 90 % relieves of microbes and a dust your bedroom, an office, a room for repose. More in detail about the technological solution of company Samsung, — Silver Coated Health, you can reading the catalogue of the equipment of the company. More in detail, the reference. The black design, — specially for this purpose what to be inscribed in any stylish and modern design of a premise. Except unique design of the internal block of the air conditioner series Samsung, — Jungfrau and Monte possess novelties and a know-how of production engineering of power-savings. 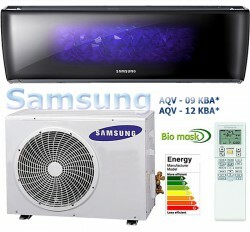 You practically twice reduce accounts for an electricity from using сплит system Samsung AQV-09/12 ABA. We wish you the maximum comfort with инверторными air conditioners Samsung AQV-09/12 KBA and AQV-09/12 ABA, — Jungfrau and Monte. « Кондиционер Samsung(Самсунг) Monte AQV-09/12 ABA, — чистота и здоровье.